In a Strange Land: SL Go Road Trip: A "Five-Star Flight to Somalia"
SL Go Road Trip: A "Five-Star Flight to Somalia"
I didn't even get photos with it, so my Firestorm shots will have to suffice. Today I thought I'd do a comparison test with Linden Lab's OnLive-based client, SL Go and my regular Firestorm client. Iris Ophelia had great luck walking around and taking photos with SL Go. Iggy, however, wants to drive a CAR and cross sims, not be a fashionista. 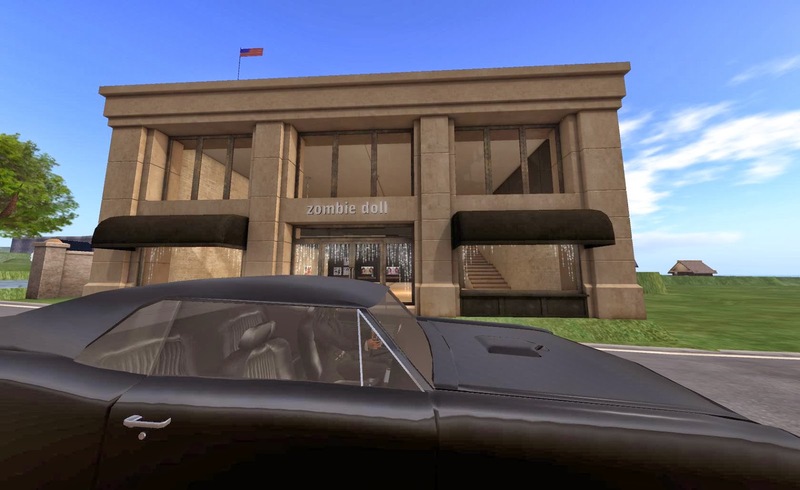 That should work in a driving game, so in this newly gamified SL, why the heck not? Yes, readers, that was fun. And familiar. I relogged and went back to the rezz spot by Linden Highway 7A to try try again. This time, things worked rather nicely! I had some rubber-banding when crossing sims, but no outright failures or crashes. I even got a few glam shots with draw-distance set to 256 meters on my viewer. Not bad for third gear in the GTO, which would have been almost racing velocity back in the olden days. I figured "if it's THIS good with Firestorm, I need to try SL GO and burn through my free 20 minutes." Fumbling along after installing OnLive, I found SL Go with some difficulty in the "My Games" section and logged in. More fumbling, all of my own doing, ensued as I navigated the client. Then I tried to rezz the car and "jump in" as the pie menu commands. I was standing in space, high above SL, unable to teleport. My friend Grizzla IMed to ask if I'd tried SL Go. My reply, about the client and Linden Lab, remains unprintable. This new experience would lure me at 99 cents an hour for a bit of gaming-style driving across SL's increasingly empty mainland, when and if SL Go works on my favored rig. Right now, $3 an hour is too steep though it could be an important new revenue stream for Linden Lab. I will try again on my Macbook Pro (their highest end model) and later with iOS when they release that client. But color me dubious, if not gone. In the end, on both log ins I saw scads of abandoned mainland and a few green dots. Linden Lab has needed something like SL Go for a long time. But the time for it may have passed. SL Go did deliver nice graphics during the three minutes before I crashed. But the core technologies of Second Life are antique. As a commenter at New World Notes so aptly put it, SL Go reminds him of taking a five-star flight to Somalia.